Stan Lee is known for popping up in all of Marvel’s theatrical films, but if you got through Marvel’s Daredevil, we’re guessing you never saw the famed Marvel figurehead show up. In fact, however, he did have a cameo; it just wasn’t exactly as prevalent as the one in Agents of S.H.I.E.L.D. was. See if you can spot Stan Lee in the image, below. 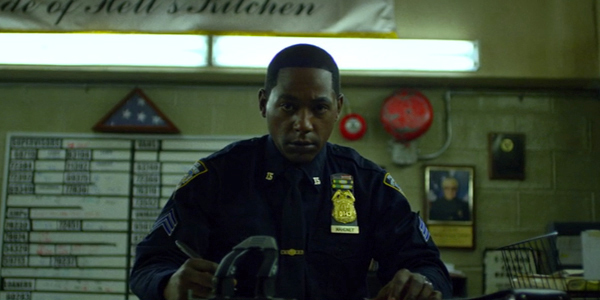 It’s easy to look at the clothed cops, first, but the cameo was even smaller than that. The Daredevil team actually stuck a photo of Stan Lee into one of those awards or memorial-type plaques that often appear on walls in police stations. 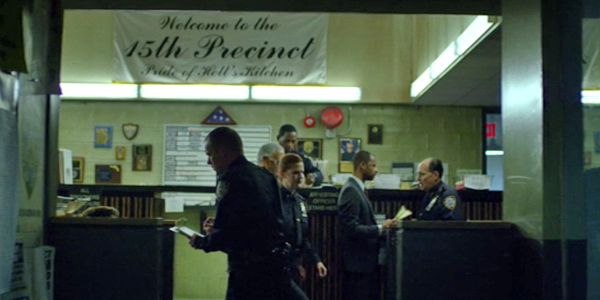 The cameo pops up in the middle of the final episode of Daredevil Season 1. Here’s a closer look at the portrait that appears in the backdrop during Episode 13. Hypable was the first to point out the seemingly sound cameo, and showrunner Steven DeKnight seemingly confirmed the cameo via Twitter in a post to a fan. It’s nice to see Stan Lee keep the tradition and get a cameo shoehorned in there, even if he couldn’t be on the series in person. However, we will say it pales in comparison to the lengthy cameo in Agents of S.H.I.E.L.D., in which Stan Lee’s character pops up on a train to chat with Coulson and Simmons. (On second thought, maybe there's a reason he usually doesn't get a slew of lines.) I think the only other time I’ve seen Stan Lee talk so much was during his guest appearance on The Big Bang Theory. Even though it’s only a portrait, it totally helps to gel Daredevil with the rest of the Marvel universe, despite the fact the series is darker and grittier. If you haven’t caught it yet, you can bingewatch Season 1over at Netflix, now.